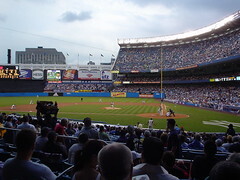 I, a couple other members of the MLB.com tech department, and some friends went up to the Bronx last night for a game… it rained right before, but then stopped, making for a nice cool night of ball… only my second game of the year! This weekend is Yankees-Cubs with a friend and his parents from Chicago. This photo and entry blogged via flickr.com!